Considering the harsh climate conditions due to scorching sun in UAE water is the most crucial element. 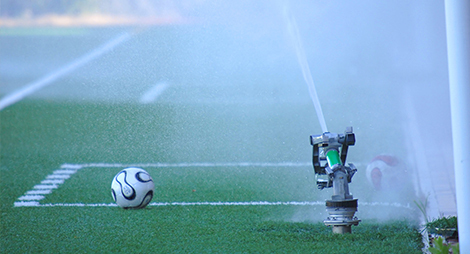 To be able to maintain overall health and vitality it is required to provide for your sport turf the right amount of water all year round. Therefore, building a correct irrigation system is essential for the success of any landscaping project. An efficient irrigation system is one of the most productive and cost-effective means for ensuring your turf and gardens remain green all year round. You can easily lead to great savings on the utility bills and conserve water wastage by receiving the hydration for the turf as it required when the irrigation system is installed professionally. Shasii Group can advise, design, consult and / or provide a complete turnkey project on water treatment, irrigation and landscaping from the design stage to installation. 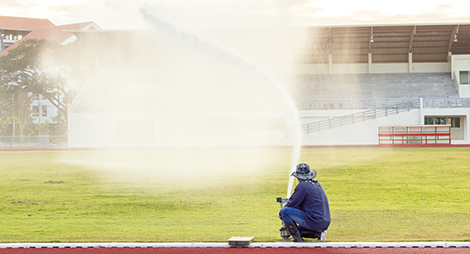 In addition to the full irrigation system services the company also offers maintenance within whole year round to ensure that your turf irrigation system is always operating at peak efficiency. Be sure that before installation, Shasii Group will evaluate the turf, through our team of qualified professionals where after all you will get a solution of the irrigation system which works seamlessly, is cost effective and one of the best scheme which suits your needs. Once it is installed, the company will visit a site with regular inspection to check for leaks or damages as well as repair any problems which will be discovered. Our installation team, ground workers, technicians have a vast experience and ready to serve in the best possible way. It can be a new system or an upgrade of already installed one, Shasii Group can provide various installation and maintenance programs and packages based on the needs and requirements.